Participants set the stage for the competition. Young attendees take a close look at the autonomous robots. Attendees cheer for their favorite robot. Members of The Police celebrate after winning the Myke Minbiole Elegant Engineering Award. A competition participant checks on his robot. A student-designed, autonomous robot named “Subsequentis” wiped out the competition to win Northwestern’s 25th annual Design Competition. In a feat of speed and agility, Subsequentis bested second-place team Excalibur for the $1,000 award. 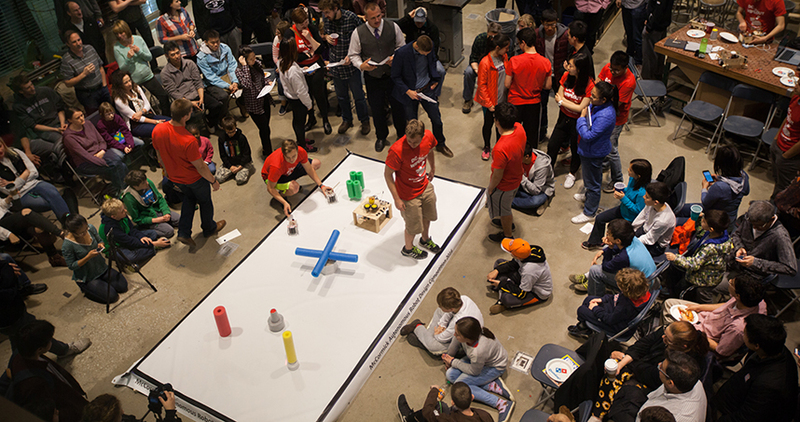 “Robot Wipeout” took place Saturday, May 14 at the Ford Motor Company Engineering Design Center. Inspired by the TV game show “Wipeout,” the competition challenged robots to dodge obstacles while trying to knock plastic cups off each other. Teams of undergraduates from a variety of engineering fields spent five months designing, building, and programming their robots. Some teams fielded classic robot designs with lasers and ultrasonic sensors; others deployed Nerf darts and rubber-band shooters. A team called “The Police” received the $500 Myke Minbiole Elegant Engineering Award. The award is named for McCormick alumnus and 2001 Design Competition winner Minbiole, who worked as an engineer before being killed in a hit-and-run collision in 2007. Members of The Police are Can Aygen, Kegan Leizerman, Cameron Tehranchi, and Bryanna Yeh.